“This tonearm cable is one of, if not the best stand alone upgrade I have ever made. Common thought is just to upgrade the tonearm and cartridge which I did, and yes it was worth it. However the Origin Live Silver Hybrid cable simply plugged into my SME V with no setting up. Just burn in and that’s it. Over many years dealers and reviewers have brought some outstanding cables to our notice which surpassed those we were using at the time. We were always faced with 2 choices. Either include these cables in our arms or develop something better. One USA cable of particular note was highlighted to us by a USA dealer who listens to a great deal of high end gear. This particular cable cost £1000 and was the best he’d come across at under £4000 which included many leading brands. We duly purchased this cable and yes, it was so good, we were going to offer it as an option with our arms. However just a month later we came across an extraordinary breakthrough in our own ongoing work with cables and this proved to comfortably outperform the £1000 market reference we were about to adopt. The breakthrough innovation was duly produced and named “Silver Hybrid Cable” at £535 complete with 5 Din Pin arm connecter and RCA phono plugs. Silver Hybrid design is revolutionary and the culmination of over 30 years in the field. It comprises Silver wires and Copper Litz wires laid up in an advanced configuration using little known handbuilt techniques. Wires are specially treated including cryogenic freezing. The highest performing Black Rhodium GN4 single point contact plugs are fitted for minimal eddy currents. The resulting sound displays an extraordinary level of definition and separation compared to most other tonearm cables. 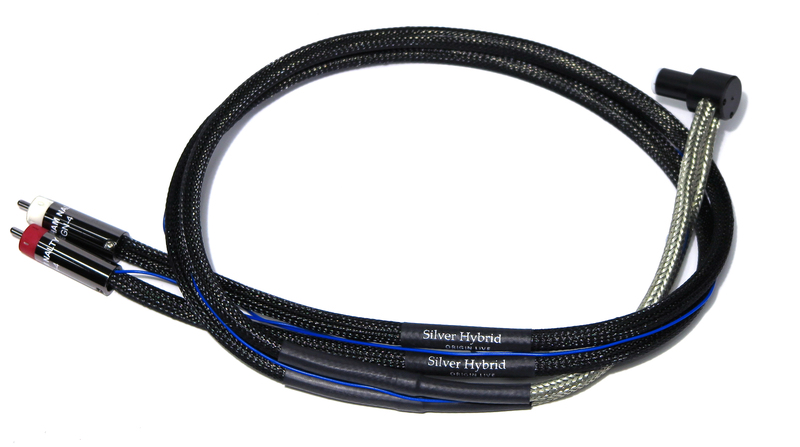 The Performance betters most Silver arm wires at many times the price.